The auctioneer asks guests to raise their bid on high-value packages by raising their bidder cards. We distribute preprinted bidder cards—showing the bidder number in large type and the bidder name in small type—in a single envelope per table according to your seating plan. On the back of the card is a pledge form. Professional auctioneers should be given discretion to set the opening bids for your live auction, whereas lay auctioneers should be provided with a planned opening bid. We recommend not publishing opening bids because having to lower a published opening bid can undermine bidding. The auction manager records the final bid declared audibly by the auctioneer. The current bid is typically projected on the screen, but underbidders are not recorded. The role of spotters is to record the winners as declared audibly by the auctioneer and to direct the auctioneer’s attention to cards being raised. They do not record bids independently of the auctioneer. The use of shills to make fake bids violates ibidmobile.net policy. It may result in winners disclaiming their bids if they learn of the scheme and is not proven to encourage other bids. Live auctions are typically scheduled during the meal service, but always after at least some programming related to the mission of your organization. 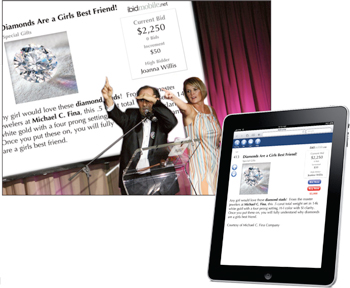 Starting a live auction late typically yields poor results and can be detrimental to the the rest of your event. Your live auction should never overlap with the close of a silent auction. Ask guests to remove bidder cards from the white envelope on the table and find the card with their name on it. Ask guests to hold up their bidder cards to bid and keep them up until they hear you call out their number. Always announce winners by their bidder number. If the bidder number is not visible, ask the bidder, spotter, or audience to call out the number. Repeat the winning bidder number over the microphone. Thank each winner. Ask the audience to applaud. Speak clearly and slowly when declaring the winner. At the close of the auction thank everyone who raised their paddle and congratulate the winners. Ask that winners claim their prizes at the auction checkout desk. Our spotters attempt to verify the name and bidder number by approaching the winners, but this is not guaranteed. It is common practice to charge credit cards that have been placed on file without further verification from guests. This may reduce the risk of buyer’s remorse. However, refunds will need to be made for erroneously recorded winners. Credit card processing fees may apply to both charges and refund.